Dr. McCune’s teaching ministry at Central Seminary and Detroit Seminary has touched many lives in fundamental Baptist circles. His solid dispensational approach to Scripture and his separatist stand for truth have kept his works relevant and timely. 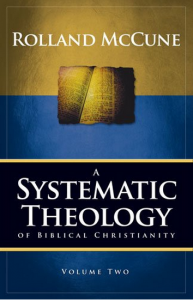 This second volume to his ongoing Systematic Theology series contains the doctrines of Man, Sin, Christ, and the Holy Spirit. McCune stands solidly on the instantaneous view of creation vs. evolution. He takes the federal headship view of the race rather than the seminal view and also argues for regeneration below the level of consciousness (to both of which I would graciously disagree with my teacher). His section on the Holy Spirit is detailed and excellent and is a solid dispensational approach to Pneumatology in the Old and New Testaments. Also I very much enjoyed the section on common grace and its effects on the world which is very relevant to today’s views on culture.